This photo of a Greek civil servant solving crosswords while a long queue of people was forming only a few meters away has forced the Greek authorities to act. 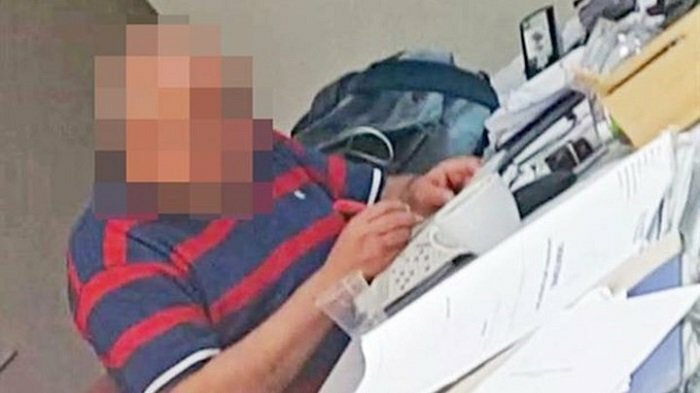 The photo, published on Monday and gone viral, apparently shows an employee of the tax registry in Heraklion Crete, busying himself with the puzzle. According to the person who took the photo, there was queue of about 20 people waiting to be served. At the time, according to neakriti website, there were three employees in the office. Two were at the counters serving, whereas the third (pictured) had other things in his mind. The Governor of the Independent Public Revenue Authority, G. Pitsillis, has ordered an investigation into the alleged incident and said that, if the complaint is valid, disciplinary proceedings against the official in question would be initiated immediately. In a circular to his employees, he says that they must “first perform and then complain” and warns that the “axe will fall heavy” to the negligent and corrupt. Greek civil service is renowned for its ineffectiveness which often brings misery and frustration to millions of Greeks. A recent survey by the University of Oxford showed that Greece is third from bottom worldwide in terms of the effectiveness of its civil service.